As commercial book publishing crashes, personal book publishing is booming. Personal book making entails printing high-quality books in very small quantities, including quantities of one. New technologies permit anyone to print one copy of a softcover or hardcover book, including all-color photo books. These printed-on-demand books are indistinguishable from commercially printed books. In fact, some of the books you buy on Amazon are manufactured with this same technology. You just can’t tell the difference. However, being able to print as few as one copy — instead of a minimum of a thousand — shifts the economics of bookmaking toward individuals with more passion than money. For the past two years I’ve been producing high-quality books in very small quantities using several different services. I’ve shown these finished books around to many people, including those in the New York publishing industry and media, and everyone has agreed the quality is first class. Several of the photo books I’ve made look like coffee-table artworks, and cost about the same, yet I can produce them one by one on demand. I’ve also made text only books which appear to be store-bought trade paperbacks or hardcover books from the bookstore. Having tried most of the services available and created dozens of books, I’m ready to recommend the best services to use. My advice is slightly complicated, because the success of book making and book publishing pivots around your aims. To turn a text manuscript into a regular book, either softcover or hard, I recommend Lulu. Their website has a very thorough step-by-step process which will enable you to make a book with the least amount of money. A 100-page trade softcover book in black and white will cost about $7 to print. Lulu will walk you through the edit, design, and production sequence. They offer templates you can follow. Once in digital form, you can easily order one book or many. Lulu will also offer help in getting your book out into the world, but it can’t really help you market or sell it. That will be your job as a self-publisher. If you are a more sophisticated book maker with your own design skills you can send Lulu a PDF file of your designed book, and simply have them print it, at the same prices. This is the way I use them. Finally, Lulu can also print full color books, including smaller full-color paperbacks. (These could run $20-30 a piece for 150 pages) The overall process of getting a book printed is smooth and fairly hassle free. A few of the books I’ve made in copies of one. The results from both Apple and Blurb are marvelous. In fact, these books are astounding. That’s because they both use the same back-room engine, the HP Indigo 5000 (as do the other color book makers like Snapfish and MyPublisher). The Indigio is essentially a high-speed, high-quality liquid-toner printer that will print your photo book several pages across. (Lulu on the other hand uses a dry toner process called iGen3 from Xerox) The final result of a Indigo-printed page is a very richly colored, very finely detailed image. It looks like a page from a color magazine. The color-match is pretty close to the image you see on your monitor, with this exception: I’ve notice that printing on paper is far less forgiving of blurred or out of focus images. The human eye notices less-than-perfect sharpness on the page more than on the screen, so you have to be far more ruthless in your editing when making a book. While Apple and Blurb both produce lovely printed books with well-crafted covers (in quantities of one), Blurb does it for a lot less money. A 100-page book of photographs will cost $100 with Apple iPhoto Books, but only $39 with Blurb. They are currently printed on the same machines. Blurb also offers more options for working directly from PDFs. Recently they announced an easy way to make a printed book version of your blog (or any part of your blog) which I have not tried yet, but will soon. Apple actually subcontracts their bookmaking to MyPublisher, so this is not their focus. Blurb, however, besides having the best prices, is the most dedicated to servicing the widening long-tail of personal book making. I’ve also played around with different sized books. 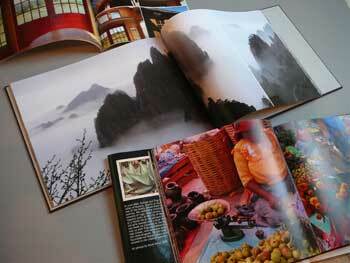 MyPublisher offers a truly coffee-table size photobook ($60) that is very impressive. I filled it with snapshots from a trip to Italy we made one year. At the other end of scale, I’ve made a number of itsy-bitsy books the size of a deck of cards with Apple iPhoto and MyPublisher books. I was first handed one of these diminutive works by a photographer who was using this cute booklet as her portfolio. Cool. I’ve made little ones this size devoted to curious themes just to hand out. There are tons of reasons why people make personal books. Artists can use a clean trim hardcover book as their portable gallery. Cookbooks take on a higher class production when you can add photos of your dishes. I even saw one Blurb-produced book that was a reproduction of a relative’s old typewritten manuscript of poetry. It had a lot of soul. Several friends who were scrapbook enthusiasts decided to switch to classy photobooks (everything is scanned first) when they saw the tidy fit-and-finish of the Blurb books. Photobooks are hot mementos for reunions. We now make a photobook from all our vacations. I attended one hi-tech conference recently at which everyone got an instant Indigo-produced color book summarizing the conference, pictures and all. At some of the foundations I am involved in, we’ve used hard cover color books of a fun meeting or trip as perfect gifts for potential funders. And nowadays Blurb books are inexpensive enough that some high school kids are making their own full-color alternative anti-yearbooks. Most information in the world today is digital and has no need to ever leave the screen. But the more personal your expression is, and the more personal the audience, the greater the impact you get by making the information tangible. For making text in black and white, use Lulu. For making color pages, use Blurb. Lulu has great online tutorials, and Blurb has released a meta-book, a book which tells you how to make a book. It’s quite well done, with solid advice useful no matter where you get it printed. While you can purchase a Blurb-made hard copy of this book, they also wisely offer a free downloadable PDF version. Blurb's How to Make a Book.